To Rent the Pure Heat Ground Heater, Call 585-292-9870 (Rochester NY) or 607-347-4455 (Ithaca NY). The Pureheat Ground Heater rental is an exceptionally powered heater that provides temporary heat for a wide ranger of building sizes, including large buildings. Whether you need to remove moisture from buildings, or if you are looking for tremendous fuel efficiency, the PureHeat Ground Heater is an exceptional rental heater. 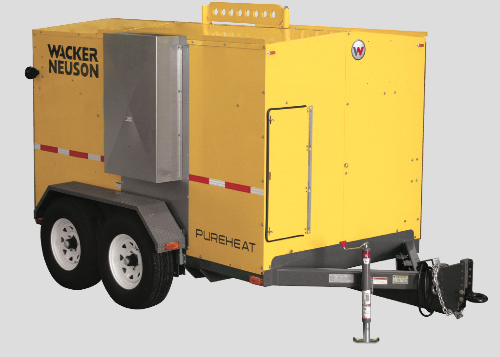 The Wacker Neuson Pure Heat Ground Heater Rental is an exceptionally powered, mobile ground heater that can be used for removing moisture, curing concrete, thawing frozen ground and preventing frost. Notably, the Pure Heat does not have an open flame providing tremendous safety and dependability. Ground Heater Rental – E5000 – Wacker Neuson Specs. Run time = 64 hours. Heater efficiency = 83% with 860,000 Btu / hour. Easy access for on-board hoses and manifolds. Fuel: flexible fuel choice of either Diesel, Natural Gas or Propane gas. Store & transport with hoses securely stored within the trailer.